For the non-Calvinists or anti-Calvinists among us who may worry that the current issue of WORLD has several articles about John Calvin, be not afraid: It happens only once every 500 years. July 10 brings the 500th anniversary of John Calvin's birth—and the great theologian, even with his warts, deserves a better press than he has typically received in recent decades. Calvin was a fallen sinner, as all of us are, but was he especially mean-spirited? He taught that God created the world out of love and loved the world so much that Christ came down from the glorious kingdom of heaven and plunged into this world's muck. Calvin saw God as a generous giver and His mercy as an abundant resource. Jehovah's Witnesses would later insist that heaven has room for only 144,000, but Calvin understood that God's grace is infinite. Did Calvin emphasize in-group harshness toward the poor and the alien? No: He wrote, "We cannot but behold our own face as it were in a glass in the person that is poor and despised . . . though he were the furthest stranger in the world. Let a Moor or a barbarian come among us, and yet inasmuch as he is a man, he brings with him a looking glass wherein we may see that he is our brother and neighbor." Everyone is created in God's image and worthy of respect. Did Calvin want us to abstain from all material pleasures? He wrote that God "meant not only to provide for necessity but also for delight and good cheer. . . . Has the Lord clothed the flowers with the great beauty that greets our eyes, the sweetness of smell that is wafted upon our nostrils, and yet will it be unlawful for our eyes to be affected by that beauty, or our sense of smell by the sweetness of that odor?" He opposed any doctrine that "deprives us of the lawful fruit of God's beneficence." Calvin also opposed doctrines that deprive us of political liberty. His understandings—that God-given laws are superior to those of the state, the king, and any other institution, and that individuals have direct access to the Bible, without dependence on pope or priest—are common now, but compare them to the political and theological theories fashionable before his time. In ancient times, pagan states revered leaders as semi-divine. Those who argued with such bosses were seen as deserving death. In medieval times, the interpretations of church officials often trumped the words of the Bible itself (which few people could read). They identified God's kingdom on earth with a church monopoly, and hanged, burned, or decapitated some with other ideas. 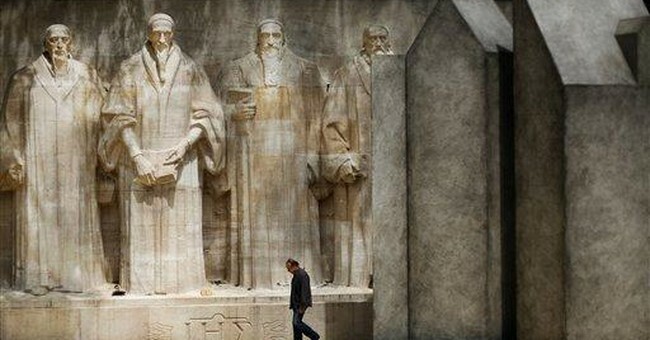 Calvin and other Reformation leaders, though, separated church and state while emphasizing the importance of believers working to lead the state. Calvin contended that, since God reigns everywhere, His followers should be entrepreneurs in every strategic institution, including government, civil society, commerce, media, law, education, the church, and the arts. This emphasis led directly to what has become known as the "Protestant ethic," with its unleashing of individual initiative and its emphasis on hard work in purportedly secular areas. Many kinds of labor are equally worthy, Calvin argued, and those in charge of one activity should not dictate to others. Calvin's writings also had an implicit anti-statism. Since fundamental law comes from God, obeying the law means obeying God, not necessarily the state. Rebellion against an unlawful state act, led by "lesser magistrates" such as local leaders, is really a justifiable maintenance of true law. One Calvin disciple in 1579 wrote Vindiciae Contra Tyrannos ("Vindication Against Tyrants"), which emphasized the limits of power. Would freedom ring? The English jurist Blackstone called "the power and jurisdiction of Parliament transcendent and absolute . . . sovereign and uncontrollable." English lawyers joked that "Parliament can do everything except make a woman a man, or a man a woman." (Some of our jurists and legislators are more ambitious.) But generation after generation of Calvinists read Vindiciae and emphasized that government must be under God. According to John Adams, its doctrines greatly influenced Americans of the 1760s and 1770s. Calvin's birthday comes six days after the Independence Day that owes much to his teaching. Bake a cake and know that Calvin was not against enjoying it.